The background: The name presumably needs no explanation, insofar as Cartier is best known as a jewelry house. Cartier perfumer Mathilde Laurent says “Cartier brings diamonds to life by showcasing them so stunningly, by introducing light and making it scintillate and shimmer. I wanted to create a fragrance that sparkles, alive with all the fire of a diamond. The juice: So Mathilde Laurent aimed for a perfume that would transmit light with the brightness of a diamond, yada yada yada. That became something about the seven colors of a rainbow refracted through a diamond, with the seven colors represented by seven floral notes (violet, lily, hyacinth, ylang ylang, narcissus, honeysuckle and tulip). The packaging: "Faceted like a diamond, the bottle captures and fractures the light in myriad colors. "2 Well, I get that they wanted a visual representation of a diamond's facets, but the Carat bottle, while not unattractive, is not hardly lemmable on the level of the last two big feminine pillars from Cartier, Baiser Volé and La Panthère. I doubt anyone is going to order Carat unsniffed just for the packaging, as I foolishly did with La Panthère. 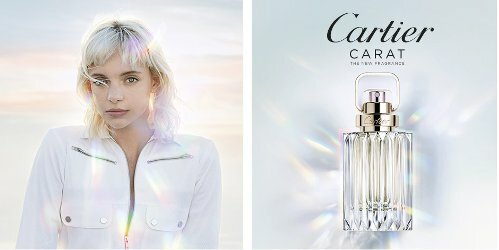 The advertising: The visuals, with model Janke Du Toit, and the matching commercial, are considerably more casual, sporty and youthful than those for most recent Cartier fragrances. The message seems to be 'fun' and 'carefree', rather than 'mystery' or 'romance' or 'luxury'. I would say they're reaching young. Who isn't? My bona fides, or lack thereof: Last year, when I reviewed Baiser Fou, I said that I like Mathilde Laurent, but we are not besties. And I did pretty much hate Baiser Fou. For a rundown on the rest of the brand's recent output, I love Baiser Volé (or at least, really really like — I wear it regularly, but it isn't one I'd grab if I had to evacuate quickly). I didn't hate La Panthère but I didn't like it so well as Baiser Volé either. The Les Heures series I've mostly ignored, just as I've ignored umpteen other luxury series. Luxury perfume generally makes me grumpy. What it smells like: It starts out a little strong and sharp, and for a few brief moments, Carat called to mind the overly-grape-y Lush Bubbly shower gel that I've been trying to use up for eons now. Just before I had time to decide if it was a poor fit with the advertising, or just a poor fit with me, it calmed into something dewy and fresh, sweetish but not overwhelmingly so, and just slightly fruity, slightly green. Ten minutes in, Carat is a pale, but bright and sunny and cheerful, spring floral. As advertised, you'll catch flashes of the individual floral notes — there are lovely snatches of narcissus here and there — but no single note dominates for long. As it dries down, it gets warmer, but not so much as to move from spring into fall, and it takes on a smidgen of powder. The lasting power is good. I would call the sillage light to moderate (at least one innocent bystander called it heavy, though, so your mileage may vary). I would be surprised if we didn't see a lighter Eau de Toilette and a heavier Extreme before long. My verdict: Beautifully done, very wearable, and yes, I like it (more than La Panthère, less than Baiser Volé). In spirit it reminds me of other soft youthful florals, like My Burberry and Carven Le Parfum (or their slightly older cousins Maison Francis Kurkdjian Pluriel Féminin and Jour D’Hermès). It won't go onto my buy list because it's not quite love, plus I do have the 'soft floral bouquet' category well covered already. Still, if a small travel spray fell into my lap, I'm sure I'd wear it. The details: Cartier Carat is available in 30 ($72), 50 ($105) and 100 ($145) ml Eau de Parfum. There are 10 ml sprays around, but so far, I've only seen them as gift with purchase. A 100 ml Hair and Body Perfumed Mist is $55. 1. Via Cartier Carat at Wonderland. Sounds good! Before you got to your comparisons, I thought it sounded like Daisy, which I find pretty well done still. I’ll absolutely gives this a smell. I can’t remember which Baiser I liked, if I’m honest. Daisy really was well done — don’t know if it still is, it must have been redone by now — have you smelled a new one? Carat is a more sophisticated fragrance, & smells like it costs more than Daisy. And I’d recommend Daisy to any age. Carat not likely to attract a pre-teen, I think? But what do I know, I have no idea what pre-teens are wearing these days. I haven’t smelled Daisy recently but I can’t imagine it had much to change, price- or restriction-wise. I think most preteens are probably wearing B&BW or Victoria’s Secret, honestly. That is true about Daisy, but I also would have thought it true of a number of other scents that have been reformulated anyway, for reasons that remain mysterious to me. I think I like Laurent’s work a little more than you, because I love both Baiser Volé and La Panthère, so I will definitely try this. Just out of interest did you like L’Envol? I liked both Roadster and L’Envol, but never spent the time I should have with the latter especially, since Kevin was reviewing it. I should get another sample. Do you like it? And do try Carat! If it was in the La Panthere bottle I might not be able to resist 30 ml. Really, Cartier ought to make that their standard bottle. I liked it on paper but less so on skin. But I did think it was good and quite distinctive. I love 30 ml bottles. I still cherish my (large) collection of my 30 ml Nicolaïs. I wish I had a larger collection of PdN 30 ml! Esp. keep regretting not getting a little Vie de Chateau when it was still around. I´ve practically got all of the older ones, only Mimosaïque is missing and Balkis EDT and a lot of the newer fragrances. It seems excessive but I love that part of my collection and wear it. I would me more than willing to send you some Vie de Château. I’ve got a large bottle, just saying. I couldn’t stand the EdP of L’Envol but I liked the EdT a lot more on the strip. Haven’t tried it on skin though, and don’t remember why I disliked the EdP. I liked Roadster and for $30 I got my boyfriend a bottle, but we don’t miss it now that it’s done. Thanks, Robin. Sounds kinda nice! And I actually like the bottle, at least in a photo. Reminds me of the Chloe Love Story bottle. Oh don’t misunderstand me, I like the bottle fine! I just don’t look at it and think, WOW, I have just GOT to have that — and that’s just what I thought when I looked at La Panthere. I have not tried Dior Joy, but had heard it was much fruitier?? But really no idea. Certainly Carat does not remind me of Love’s Baby Soft. How fortuitous this popped up today. I must have missed hearing about this one (and practically everything else this year) and randomly sampled it today at Nordies. Walked around a bit and went back for a sample. By the time I got home I was ready to order. I kept waiting for it to become completely boring and smell like deodorant and it never went down that road. Reminds me of a nineties clean floral but I can’t capture which one or if it’s just the general feel. I missed nearly everything this year too! I think that young people generally don’t worry about seasonal fragrances, and prefer lightweight. Just tried this today and I must admit liking it a lot. It will need a bit more trying before I decide on a bottle but it´s very lovely. I think it is going to find lots of fans here. Thank you for reviewing Carat, Robin. It sounds promising, I like the idea of a succession of floral notes and a little powder. Like you, I think I have enough in this genre, though. Give it a smell if you see it!